So, where were we? NTR (Nandamuri Balakrishna) had just established the Telugu Desam Party, stopped acting in films, and was ready to take on a real-life foe more formidable than all his cinematic foes combined, Indira Gandhi. There are three terms as the Chief Minister of an undivided Andhra Pradesh, multiple political coups and a gripping family drama to cover in just over two hours. This should make for a great portrait of a conflicted yet compelling man. Why is a film titled NTR - Mahanayakudu turning into a romance? Why are we not even past Annagaru's first term as Chief Minister? Ah, you cheeky scamps. You baited, you switched, and you somehow managed to not live up to the lowest of expectations that were set for you. How do stories about captivating personalities turn into such tepid cinematic affairs, you may ask. The answer to that is as old as time itself. Most of us have heard the saying "History is written by the winners". At this specific juncture, however, history is being written by the people telling his-story. While the makers of this movie may have walked into this project by assuming the aforementioned idiom absolves them from any of their cinematic sins, they fail to realise that they are one of the few exceptions to the rule. Having an icon of Telugu culture as the basis of the story being told can only add so much goodwill to a film that has no dramatic tension, is riddled with pacing issues, and embellishes history. While the previous entry to this duology had decades of a man's life to build its story around and possessed a veritable highlight reel of fan service moments to zing up its screenplay, the events of NTR - Mahanayakudu chronicle about two years in the life of the former Chief Minister. While you and I both know that two years are hardly enough of a time frame to bestow the title of "Great Leader" upon someone, the film dusts this criticism off and goes ahead guns a-blazing. However, akin to those roll caps we all enjoyed firing off during the intersection of our childhoods and Diwali, a few of them work and a few go dead while the overall idea itself seems like a lot of sound and fury amounting to nothing more than momentary enjoyment. The few aspects of NTR - Mahanayakudu that work are Balayya's career-defining performance as he offers up a touching interpretation of his legendary father's life. Matching him pound-for-pound yet again is Vidya Balan as Basava Tarakam. Even though the character is underwritten (again) and the film has no intention of showing her as anything more than a doting wife (again), the quieter moments shared between the patriarch and matriarch of the Nandamuri family, be it in a hospital ward or their familial home, are arguably the best parts of a confused movie. 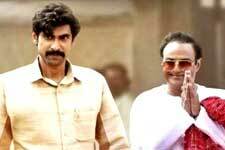 The introduction of Rana Daggubati as Chandrababu Naidu adds a sense of urgency and a layer of political gamesmanship to a film with a blatant partisan slant. Every scene that involves the future Chief Minister drips with intrigue and has shades of a three-dimensional, fascinating, crafty and driven individual whose story would have made for a better Krish film than the one we ended up getting. Diametrically opposed to this arresting supporting character is the two-dimensional portrayal of Nadella Bhaskar Rao by Sachin Khedekar. With weak motivations, a weaker coup on the incumbent government and the weakest of all cinematic resolutions, Khedekar's character seems almost inconsequential to the larger story being shared between Madam Gandhi and Annagaru. And therein begin the duds. The flaccid nature of the central conflict of the film. The overuse of "epic" music and staging while the film and its character do little to deserve it. 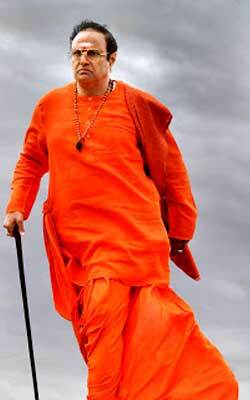 The reiteration that NTR is equal to, if not greater than, The Almighty. Scene after scene and sequence after sequence of a character who seems infallible at every turn makes watching a full two hours of said character's journey a tedious affair. We ask, what were we supposed to learn from this film? We observed, in close quarters, as NTR defied norms, broke boundaries and took Telugu cinema to new heights in the previous film. Even though the character remained infallible, a common viewer can understand the physical, mental and psychological limitations of a human being and the toll it takes on someone to overcome those limitations. With this latest entry, however, NTR is shown to be a political novice who rarely learns a new skill, and benefits from the tact and guile of others. Shouldn't the Almighty be well-versed in all aspects of humanity? Apparently, not. As these obvious observations about the film slowly sunk into the rowdy set of fans in our cinema hall, it dawned on them that Diwali was over, that their stash of roll caps was empty and that there were a lot more duds than goods. They tried to sing along with the songs, they tried to be roused by the music, they tried to take in the scenery, and they tried their hardest to be compelled by the story and performances. They tried. The film, not as much. When your core audience leaves a cinema hall deflated, as filmmakers, you done f*cked up. Enjoyed the review thoroughly! The movie was exactly what I expected , not to show the latter part. Enough of the ’Bhajana’..
All of us know that pushing a certain narrative in an election year is the order of business here but the people who made it botched it horribly. Especially when it comes to information available in the public domain, tricking people is that much harder. These movies suffer from the same issues Mahanati went through but to a higher degree because of the stature of NTR and fine toothed comb with which his life has been looked through. fullhyd.com has 700,000+ monthly visits. Tell Hyderabad what you feel about NTR Mahanayakudu!